기본정보 4/4 사이즈 Vision - Set 입니다. 수명이 타 제품과 비교해 연장되었습니다. Thomastik-Infeld, the innovative leader in orchestral string design and production for 85 years, are pleased to continue their legacy with the introduction of the Vision(tm) strings for violin. These strings are specifically designed to fulfill the needs of advanced violinists, including those who excel in orchestreal or chamber group settings. They settle in quickly and can achieve a stable tuning within a very short time and are exceptionally easy to play. Their durability is unsurpassed compared to other synthetic core strings. Players will be pleased with the compatibility between Vision(tm) strings and other Thomastik-Infeld synthetic core strings such as Dominant(tm), Infeld(tm) Red and Blue. 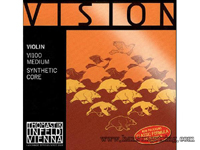 Vision(tm) violin strings - made with your vision in mind. 그것이 계속 이어져 내려오고 있다는것에 기쁘게 생각합니다. 바이올리니스트의 요구를 완벽히 이행하는 디자인입니다. 현들은 빠르게 교체되고 짧은시간에 조율할 수 있으며, 연주하기 쉽습니다. 현들의 연속성은 다른 합성현과 비교했을 때 매우 뛰어납니다. 같은 다른 THOMASTIK-INFELD 현들 사이의 호환성에 만족할 것입니다. VISION 바이올린현은 당신의 마음속에 있는 미래와 함께 만들어집니다. The sound of Vision(tm) strings is focused, clear, open and brilliant. Vision(tm) strings can be mixed with almost any synthetic core string.